Epidural and subdural infections are similar in that both are suppurative infections that may cause clinical problems by extrinsic compression of CNS structures. They differ in almost all other ways. Both are unusual and are often discovered in the course of investigation for other more common clinical entities. For purposes of this discussion, epidural infection is considered synonymous with spinal epidural abscess, and subdural infection is considered synonymous with intracranial subdural empyema, unless otherwise noted. Epidural infection, by definition, involves the epidural space between bone and dura. This is a true space in the spinal canal that posteriorly is filled with epidural fat, small arteries, and a venous plexus. Infections tend to spread over several vertebral levels. Anteriorly, the spinal epidural space is a potential space because the dura adheres tightly to the vertebral body. Abscesses are more frequent in the larger posterior epidural space. Spinal epidural abscess with cord edema and compression. Abscess extends into paravertebral tissues. Subdural infections (eg, subdural empyema) occur beneath the dura. Infection spreads over the brain and may penetrate into the parenchyma of the brain or may cause diffuse cerebral edema. No clear estimate of frequency for subdural empyema exists, but it is uncommon. Subdural empyema is said to account for 15-25% of pyogenic intracranial infections. Extrapolating from frequency figures for brain abscess yields roughly 1-2 cases per 10,000 admissions to a tertiary care center. Spinal epidural abscesses are, in themselves, not fatal. However, with complications and associated conditions, mortality rates of 5-23% are reported. Paraplegia or quadriplegia is a frequent sequela. Disability seems related to severity and duration of symptoms prior to institution of therapy. Most case series of subdural empyema report mortality in the 30% range. A declining mortality rate in recent years has been reported. About 40% of survivors develop a seizure disorder. This disorder was uniformly fatal in the preantibiotic era. No predilection exists with epidural abscess. In subdural empyema, men are 3-4 times more commonly affected than women. Spinal epidural abscess may be found in all age groups; on average, patients are older than 50 years. Intravenous drug users with spinal epidural abscesses are, on average, aged 35 years. Subdural empyema may occur at any age but is most frequent in the second and third decades of life. Tunkel AR. Subdural empyema, epidural abscess, and suppurative intracranial thrombophlebitis. Mandell GL, Bennett JE, Dolin R, eds. Principles and Practice of Infectious Disease. Elsevier Churchill Livingstone Inc; 2010. Vol 1: 1279-1287. Hooten WM, Kinney MO, Huntoon MA. Epidural abscess and meningitis after epidural corticosteroid injection. Mayo Clin Proc. 2004 May. 79(5):682-6. [Medline]. Kauffman CA, Pappas PG, Patterson TF. Fungal infections associated with contaminated methylprednisolone injections. N Engl J Med. 2013 Jun 27. 368(26):2495-500. [Medline]. Bluman EM, Palumbo MA, Lucas PR. Spinal epidural abscess in adults. J Am Acad Orthop Surg. 2004 May-Jun. 12(3):155-63. [Medline]. Ptaszynski AE, Hooten WM, Huntoon MA. The incidence of spontaneous epidural abscess in Olmsted County from 1990 through 2000: a rare cause of spinal pain. Pain Med. 2007 May-Jun. 8(4):338-43. [Medline]. Osman Farah J, Kandasamy J, May P, Buxton N, Mallucci C. Subdural empyema secondary to sinus infection in children. Childs Nerv Syst. 2009 Feb. 25(2):199-205. [Medline]. Mehta SH, Shih R. Cervical epidural abscess associated with massively elevated erythrocyte sedimentation rate. J Emerg Med. 2004 Jan. 26(1):107-9. [Medline]. Davis DP, Salazar A, Chan TC, Vilke GM. Prospective evaluation of a clinical decision guideline to diagnose spinal epidural abscess in patients who present to the emergency department with spine pain. J Neurosurg Spine. 2011 Jun. 14 (6):765-70. [Medline]. Ju KL, Kim SD, Melikian R, Bono CM, Harris MB. Predicting patients with concurrent noncontiguous spinal epidural abscess lesions. Spine J. 2015 Jan 1. 15 (1):95-101. [Medline]. Liu C, Bayer A, Cosgrove SE, Daum RS, Fridkin SK, Gorwitz RJ, et al. Clinical practice guidelines by the infectious diseases society of america for the treatment of methicillin-resistant Staphylococcus aureus infections in adults and children: executive summary. Clin Infect Dis. 2011 Feb 1. 52 (3):285-92. [Medline]. Lefebvre L, Metellus P, Dufour H, Bruder N. Linezolid for treatment of subdural empyema due to Streptococcus: case reports. Surg Neurol. 2009 Jan. 71(1):89-91; discussion 91. [Medline]. Davis DP, Wold RM, Patel RJ, et al. The clinical presentation and impact of diagnostic delays on emergency department patients with spinal epidural abscess. J Emerg Med. 2004 Apr. 26(3):285-91. [Medline]. Grewal S, Hocking G, Wildsmith JA. Epidural abscesses. Br J Anaesth. 2006 Mar. 96(3):292-302. [Medline]. 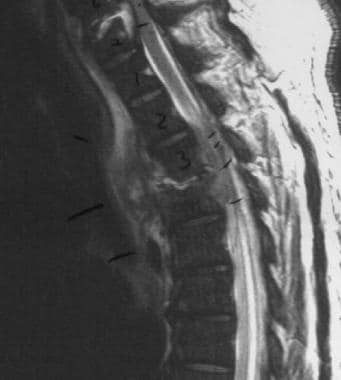 Joshi SM, Hatfield RH, Martin J, Taylor W. Spinal epidural abscess: a diagnostic challenge. Br J Neurosurg. 2003 Apr. 17(2):160-3. [Medline]. Marsh EB, Chow GV, Gong GX, Rastegar DA, Antonarakis ES. A cut above. Am J Med. 2007 Dec. 120(12):1031-3. [Medline]. Reihsaus E, Waldbaur H, Seeling W. Spinal epidural abscess: a meta-analysis of 915 patients. Neurosurg Rev. 2000 Dec. 23(4):175-204; discussion 205. [Medline]. Rigamonti D, Liem L, Sampath P, et al. Spinal epidural abscess: contemporary trends in etiology, evaluation, and management. Surg Neurol. 1999 Aug. 52(2):189-96; discussion 197. [Medline]. Sendi P, Bregenzer T, Zimmerli W. Spinal epidural abscess in clinical practice. QJM. 2008 Jan. 101(1):1-12. [Medline]. Shah NH, Roos KL. Spinal epidural abscess and paralytic mechanisms. Curr Opin Neurol. 2013 Jun. 26(3):314-7. [Medline]. Siddiq F, Chowfin A, Tight R, Sahmoun AE, Smego RA Jr. Medical vs surgical management of spinal epidural abscess. Arch Intern Med. 2004 Dec 13-27. 164(22):2409-12. [Medline]. Soehle M, Wallenfang T. Spinal epidural abscesses: clinical manifestations, prognostic factors, and outcomes. Neurosurgery. 2002 Jul. 51(1):79-85; discussion 86-7. [Medline]. Trombly R, Guest JD. Acute central cord syndrome arising from a cervical epidural abscess: case report. Neurosurgery. 2007 Aug. 61(2):E424-5; discussion E425. [Medline].